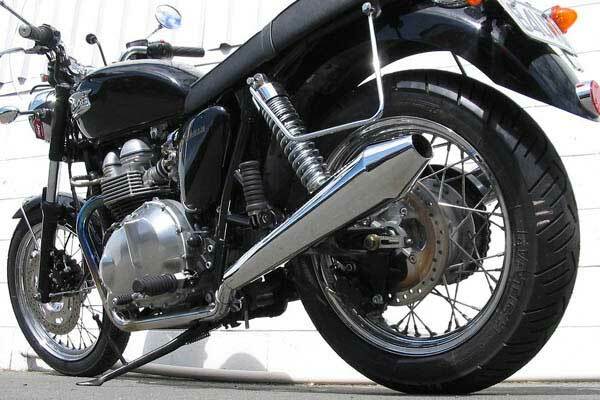 These slip on performance exhaust mufflers will fit all model year Bonneville T100 and the pre-09 carb model Bonnies with non mag wheels. If you have a 2009 on EFI Bonnie or Bonnie SE please click HERE to see our other listing. The results on the asthmatic stock 800 engine are excellent. 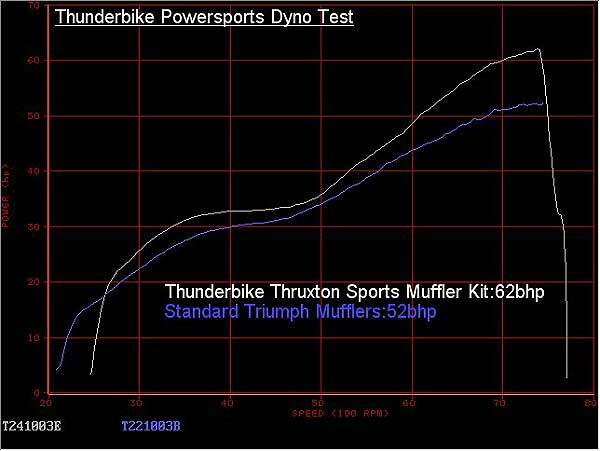 The dyno curves speak for themselves. The power is boosted right across the range with a 10 bhp peak increase around 7400 rpm - that's a 20% power gain on the 790cc engine. 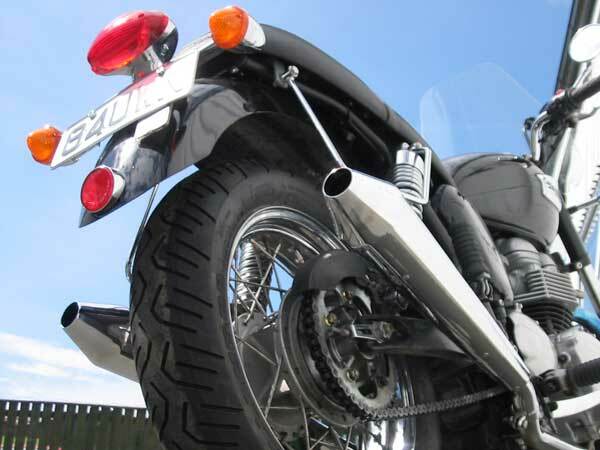 Please note: These mufflers are also suitable for the 865cc (900cc) Bonneville up to 08 and T100 all years. A great compliment with these mufflers is the Air Injection Eliminator Kit - to help stop the "popping" on the overun and to reduce "blueing" of the exhaust header pipes. No re-jetting required on carb models! 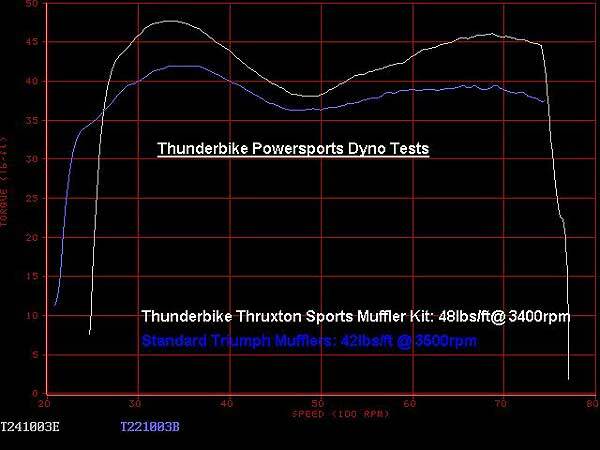 EFI T100's will benefit from having the Triumph aftermarket pipe tune downloaded or ask us for a TuneECU hex file fuel map. 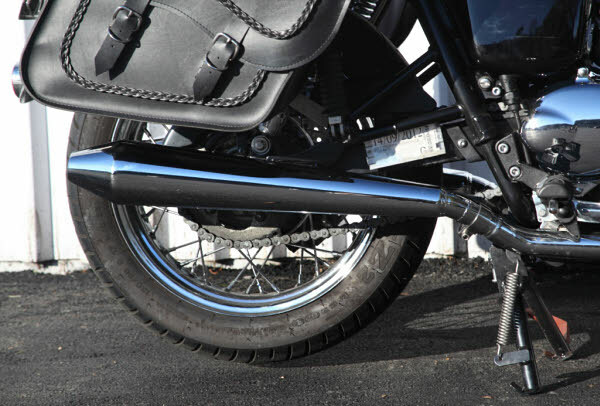 Also available as a low level pipe for more saddlebag clearance. See photo on the right. Please note: Our optional centre stand stop bracket will be required if your Bonneville has the factory option centre stand fitted. Please mention this in the comments box on the order form page. Our exhausts are made to order and the lead time to manufacture is 3-4 weeks plus shipping. Orders are charged when they are ready to ship and the prices below include shipping costs.